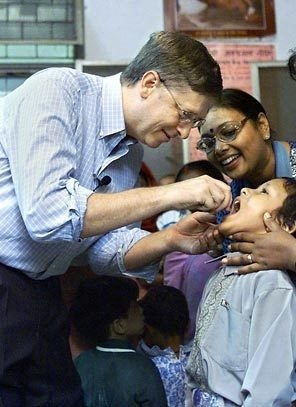 Expert medical pediatricians in India have criticized the World Health Organisation (WHO) and the Bill & Melinda Gates Foundation for their illusory promise of polio eradication without noting the devastating side effects its vaccination regiment could inflict. Numerous problems have surfaced from what Dr. Neetu Vashisht and Dr. Jacob Puliyel of the Department of Paediatrics at St Stephens Hospital in Delhi have termed an “unethical” advocacy that spanned more than a decade. That vaccination program, funded only through an initial series of grants, has saddled the Indian government with health program costs and exposed the public to new risk factors. As these doctors point out in their criticism, polio while seemingly disappearing, could easily see a sudden return in weaponized form. Since its lab synthesis in 2002, its resurrection is deemed probable and perhaps imminent, rendering the disease, thus, impossible to permanently eradicate and immunization efforts ineffective and costly. So did polio vaccines trigger these new cases of paralysis? Related studies in India have already demonstrated that polio vaccines are the leading cause of polio paralysis. Yet the 100-180 cases of paralysis per year in India admittedly linked directly to receiving the polio-vaccine, the recognized development of vaccine-associated polio paralysis (VAPP), pales in comparison to the 47,500 cases of non-polio paralysis. Further, polio vaccines have been widely blamed for deaths and damages in the neighboring country Pakistan. A government inquiry there confirmed the effects of the polio vaccine, funded under a GAVI program. Its investigation revealed that the GAVI alliance was recommending untested vaccines, and asked that all GAVI-recommended vaccines be suspended until testing showed their safety and efficacy. While the human costs are the starkest reminder that bad policy in philanthrophy and government alike can damage lives, the economic toll of the vaccination program has also reflected badly on the involvement by the World Health Organization and Gates Foundation, both core partners of GAVI (Global Alliance for Vaccines and Immunization), which also boasts the Rockefeller Foundation, World Bank and United Nations as partners. Their recommendations to achieve total vaccine saturation of populations in poorer countries are obscene, if only on the basis of cost alone. These doctors rightly blast the unethical dilemma Indians face after being advised to make the vaccination campaign a top priority and committing the government into sinking $2.5 billion in expenditures over the span of the program. Yet, the polio campaign was initially funded by only a $2 million dollar grant and its hopeful-sounding mission. “The Indian government finally had to fund this hugely expensive programme, which cost the country 100 times more than the value of the initial grant,” their report stated. This kind of unethical partnership between the WHO and private entities is reminiscent of the corruption we saw in the H1N1 Swine Flu Scare where the World Health Organization declared a pandemic, later admittedly elevated on flimsy pretenses to create demand for the vaccine. This was exposed by Council of Europe Health Committee Chairman Wolfgang Wodarg who demonstrated that drug firms collaborated with WHO officials to deliberately create a “campaign of panic” and a ‘false disaster’ over swine flu pandemic fears not proportionate to the real dangers. This page contains a single entry by sal published on April 6, 2012 4:29 PM. Babies Sleep Better If They Are Drugged And Vaccinated In The Afternoon was the previous entry in this blog. Trauma Release For Enhanced Health And Happiness is the next entry in this blog.